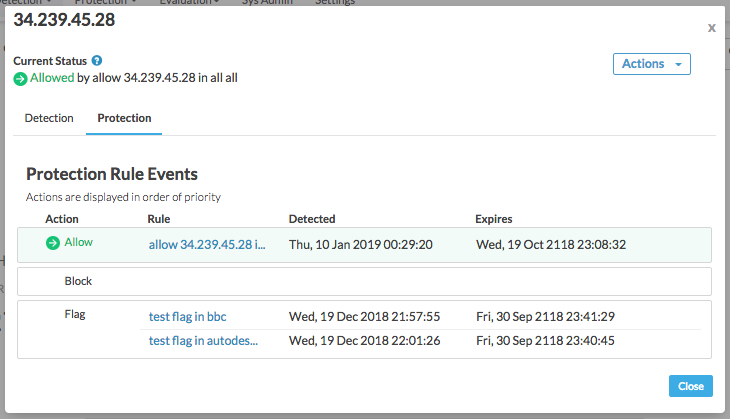 For each client IP address included in analysis, Apigee Sense now provides a way for you to see the actions that could affect requests from the IP address. Details about each IP address now include a list of the actions taken for the IP address. These are listed in precedence order, from first to last. You'll find IP details by clicking an IP address. For example, in the Apigee Sense console, click the Detection menu, then click Report. In the report page, click List View, then click an IP address. You can now view a list of client IP addresses with the actions -- Allow, Block, or Flag -- that has been taken for each. You can click an IP in the list to see more detail about protection rules enabled for the IP address. To reach the Protection Status page in the Apigee Sense console, click the Protection menu, then click Status.